We begin the journey from Jammu, move towards Batala and then head south to the city of the Golden temple, Amritsar. Before visiting Amul Fed Dairy, we visit Amul Banas Dairy in Palanpur and Amul Mehsana Dairy in Mehsana, post which we will spend the night in Ahemdabad.  Culminating our journey, we now ride towards the milk capital of India, Anand. Copyright © 2017, Finding Dr. Kurien. All rights reserved. Copyright © 2018, Celebrating Dr. Kurien. All rights reserved. Objective of the rally and bikers participation is that through them, nation should know Dr. Kurien, The Milkman of India. We will be shooting each day to broadcast it on social media. Bikers have to participate in social conversation as per the directions of the shooting team and participate in all movements, discussions, visits to specific locations, dairies and en-route activities which we deem fit to highlight Dr. Kurien's life and contribution in uplifting rural poor. This will be uploaded on social media later. Under no circumstances will the biker hold Amul or any person/ organization connected/ associated with organizing/ assisting in the National Milk Day journey, responsible for any sort of injury/ sickness/ damage/ loss/ accident/ delay or irregularity during or arising out of this trip. Biker will abide by all rules and regulations laid down by the organizers, failing which the biker authorizes the organizers to immobilize his/her vehicle and leave without them. Biker shall abide by the decision of the organizer. Biker will voluntarily participate and is fully aware of all the associated risks to his/her life and material belongings.